The Thompson's Station Farmers Market begins Wednesday, May 2 and continues every Wednesday through July 25 from 4 to 7 p.m. in the barn at Homestead Manor. Friends, we’ve come to the last week of the Thompson’s Station Farmer’s Market for 2017! It has been a great summer full of sun, smiles, and fellowship at our market. As we approach the last market of the season on Wednesday, we've decided to take a look back at some of the highlights from the last couple months. We had our first ever Night Market on May 31st. We had a record breaking crowd of over 800 people on the property with live music from Tessa Victoria, Taylor Dukes, and Alicia Smith. Food trucks sold delicious dinner for the customers to enjoy while they shopped, and the property was full with picnics and families enjoying time together. On August 2, we held our second and final Night Market of the 2017 season. We had live music from Marcus Whybrew, Tessa Victoria, and Alicia Smith. Yayo’s OMG came back out to the property to sell their tasty Mexican food to the attendees, and there were s’mores by the firepit! 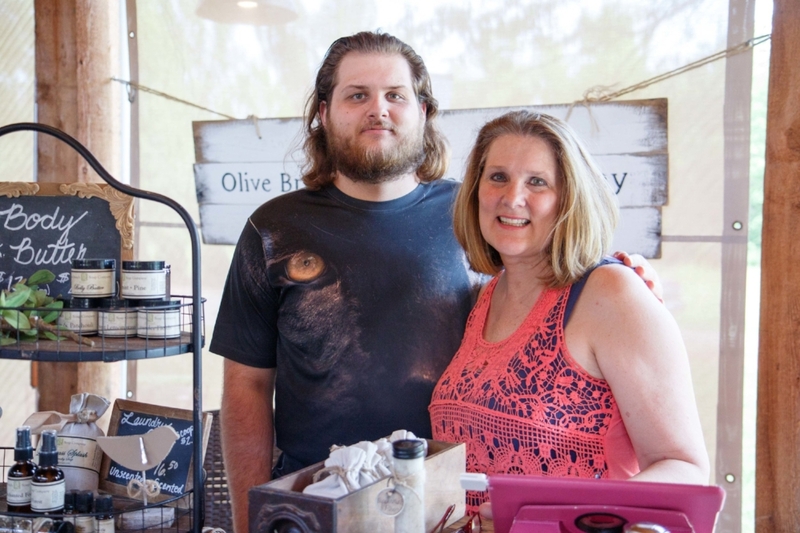 Our night market was picked up in the media by Williamson Source, Style Home Page, Columbia Daily Herald, Spring Hill Fresh, and the Puckett’s Blog. The TSFM was featured in the July/August issue of Edible Nashville. The ad highlighted three vendors that we like to love on -- Olive Branch Natural Soaps, TriaHerbs, and Southern Ridge Farm! Different food trucks joined our market throughout the summer such as 313 Coney, Yayo’s OMG, Florinda’s Food Truck, and New Hickory Food Truck. We had a total of 36 different local vendors participate throughout the summer. We saw products all the way from produce hot pretzels, and everything in between! These were some of the biggest highlights from the this market season. This week we will host the last market of 2017 in the Barn at Homestead Manor. Come hungry for chicken sandwiches from New Hickory Food Truck. Whether you are a weekly shopper at our market or haven’t had the chance to attend this summer, we want to thank you for the support. We look forward to seeing you Wednesday from 10a-2p! Join us in celebrating National Farmers Market Week, announced by the United States Department of Agriculture (USDA), taking place through August 12th! In honor of all the farmers markets around the world, we want to give you some fun facts about farmers markets, where the concept originated, and why they’re so special! According to the USDA, the evolution of farmers markets date back to 1730 in Lancaster, Pennsylvania. In 1730, the Lancaster city designers left a 120 square foot space in the center of town that would eventually become the Lancaster Central Market. The market continued to grow, and it is believed that at some point the market had over 400 vendors at a time! This is said to have been the beginning of the farmers market concept. Today, there are over 8,000 farmers markets in the United States, and they will only keep growing from here! Farmers markets are well loved by their communities across the country, and we don’t feel any differently! We want to say thank you for all the love and support we get week after week. We’ve had a great market season, and we hope we will see you for the last three weeks of our market here in Thompson’s Station. We’re opening our doors to three NEW vendors joining us at the Thompson’s Station Farmer’s Market for the remainder of the market season! Here's a glimpse into what you can expect to see from our new friends every Wednesday. If you have a sweet tooth, go see Jennifer Sanders at her booth called Kola Reina Gourmet Caramels. She hand crafts delicious caramel treats and has multiple flavors including Caramel Apple, Original, S’Mores, and Turtle! You can’t go wrong with any of these flavors so make sure you swing by and sample her products. Our next new vendor appeals to the health-conscious dog lover! Alyce’s Pawstries offers six varieties of home-baked, all natural, preservative-free dog treats. The business was named after a beloved Golden Retriever named Alyce that struggled with numerous food allergies. The flavors you will find at the booth include Aint Nothin’ But a Hound Dog, Beggin’ for Bacon Cheeseburger, Scooby Sticks, Sweet Potato Casserole, Layla’s Apple Cheddar Biscuits, and Clifford’s Chicken Crunchers (wheat-free). Don't forget you can bring your pup to our market (for some samples) on a leash! The third addition to our market is Blooming Sisters! Sandra Mayfield and her sister will be selling freshly cut flower bouquets grown right on a farm in Maury County. You can get any of these bouquets for just $5, and if you want to save yourself the hassle, for an additional $3 they'll put it in a cute and colorful mason jar vase. These arrangements make for the perfect gift or table centerpiece. We hear these ladies like to make pies too, and you might just see them at their booth as well. Even though we’ve entered the final month of the market season, we’ve got a lot going on at the Thompson’s Station Farmer’s Market. The market will be returning back to its normal hours next week. We hope you’ll join us in the Homestead Manor Barn between 10a-2p. See you Wednesday! It’s finally here! The Thompson’s Station Farmer’s Night Market is happening NEXT WEDNESDAY! In May, we welcomed over 800 people to the property for our first ever Night Market, and we’re thrilled to host our last one of the season. As before, the night market will be happening from 4-7p in the Barn at Homestead Manor. Look for your favorite vendors you see week to week at the market, along with a few new ones. Be sure you come hungry so you can enjoy food from the food trucks on site. While you are walking around the barn enjoying your dinner and shopping all the local vendors, you’ll hear live music from local singers/songwriters. The lineup will include Marcus Whybrew, Tessa Victoria, and Alicia Smith. And don’t forget to top off your evening with s’mores by the firepit. We hope to see you out next Wednesday night. Please note that there will be [NO DAY MARKET]. Stop by on your way home from work or for a nice evening outing with the family! Feel free to bring picnics and blankets to enjoy the property. There will be plenty of places to sit, enjoy each other’s company, and fellowship! We hope to see you Wednesday, August 2nd from 4-7p. Ben, with his set up and ready to sell at our market. Thanks to our friends at Spring Hill Fresh for the photo! This week on the blog we want to share with you the story of one of our dearest friends from the market, Ben Seaborn! 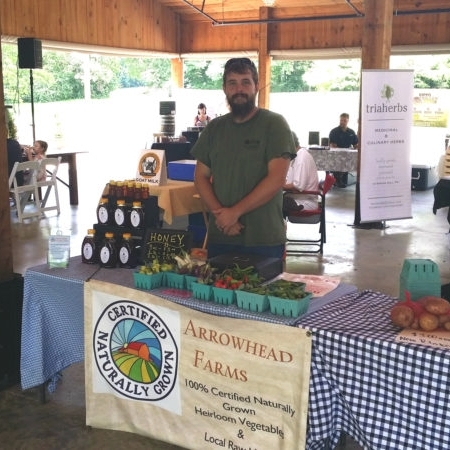 Ben is the friendly face you will see working the Arrowhead Farms booth each Wednesday in the Barn at Homestead Manor. Ben is a seventh generation farmer in Middle Tennessee, and his daughter will make the eighth. He’s been farming his whole life, but Arrowhead Farms has been a certified business for about four years. The farm is located in Centerville, Tennessee and is run by Ben and his wife Emmy, his daughter, and his younger sister and her children. It has been in the family for 25 years, dating back to when his mother and father purchased the land. Ben eventually moved back home and bought a house on land adjacent to the farm. Ben describes a typical day on the farm to begin around 6am. The family begins with chores, they feed and water the livestock, and then they spend most of the morning picking produce and tending the fields. During the hot summer months, the afternoons are spent playing in the creek! The peak seasons for the farm happen during the Spring and the Fall. However, they are producing a variety of products year round like tomatoes, eggplant, bell peppers, green beans, garlic, blue potatoes, corn, lettuce, squash, baby carrots, radishes, pumpkins, melons, and berries. Eventually, the public will be able to visit the farm themselves and pick their own berries! The family also raises pigs and chickens, so they sell chickens and meat. Additionally, Ben’s father has been a commercial bee keeper for 30 years, so you can also find some local honey at their booth! Are you wondering… where did the name “Arrowhead Farms” come from? We were wondering the same thing! According to Ben, you can find actual arrowheads on the farm that they pile up and collect every year! If you want to learn more about the business and see pictures, updates, and exciting news, be sure to follow Arrowhead on Instagram here, and check out their Facebook here! There are some strong, delightful smells at our market and we've figured out why. Meet one of Spring Hill’s finest, Spring Hill Bakery! Sarah, owner of Spring Hill Bakery and her husband Corey. Every week, you can find Sarah at the Thompson’s Station Farmer’s Market. The business started out in their home kitchen in April of 2015. Corey took care of the marketing, accounting, and the website so Sarah could take the orders and run the business. That summer, Spring Hill Bakery did their first farmer's market, and after a very successful season, they started getting more orders and regularly selling out at local events. For the business’s second year, they decided to take on more farmer’s markets, and they set their eyes on Thompson's Station in the market's first year. Eventually, an opportunity arose for Sarah to rent commercial kitchen space. In March of 2016, their capacity grew, and they were able to take on more work and hire staff to meet demand. Corey contacted the Thompson’s Station Farmer’s Market early in the season and asked for an application, and of course we were more than happy to oblige! Since then, Spring Hill Bakery has baked bread for Homestead Manor and Scout's Pub, participated in Homestead Manor’s Holiday Village, and had their products in other awesome restaurants in the community. Handing off a bag of deliciousness to a customer, Sarah always has a big smile on her face. We love our friends at Spring Hill Bakery and also love hearing about their success story and how our market has impacted it. This is just one of the many exciting stories of the vendors that show up. And by the way, we are taking applications to be in our market throughout the rest of the season! Happening every Wednesday from 10a-2p through the end of August, we are looking for vendors who Grow It, Raise It, Make It, or Bake It. And don’t forget our last night market of the season happening August 2 from 4-7p! In order to be eligible for this market, you must submit photos with a list of the products you intend to sell. No direct sales companies may participate. If you are interested in applying to be a vendor, you can register here! If you have questions, please contact us. We love the passion and talent that this community breeds, and we’d love to have you at the Thompson’s Station Farmer’s Market. We look forward to seeing you this Wednesday from 10a-2p, and don’t forget to pick up some of Spring Hill’s Bakery DELICIOUS freshly baked bread! Berries, berries, and more berries, please! This week on the blog we're sharing the background on a family business that's been passed down through the generations. We spoke with Hunter at the market representing Kelley’s Berry Farm. Here's Hunter selling the last of his blueberries for the day. The farm is located in Castalian Springs, TN (just North of Lebanon). The business was started in 1978 when Hunter’s grandfather bought the property located on the riverbanks of the Cumberland River. The farm began as a nursery for trees and plants, but Kelley Sr. eventually planted berries and blueberries came first. Eventually, more berries were added as Hunter’s father and uncle took on the business. The plan is for Hunter and his cousin to take the reigns when they're ready. This business will continue to pass down through the Kelley generations. These fresh strawberries are a hot commodity at our market. Get there early because they go fast! A typical day on the berry farm starts around 5:30am. They start by picking all of the berries until around mid-morning. Next, they sell the harvest at farm stands and markets. Did you know you can pick berries yourself? If you head out to see the Kelleys, you can pick all the berries you’d like for $3 a pound. The farm itself is 180 acres, including 8 acres of strawberries, 12 acres of blueberries, and 5 acres of blackberries. The Kelleys offer multiple fresh products, including berries such as blueberries, blackberries, and strawberries. The planting of the produce begins in September, then come May, it's time to harvest the strawberries. During the first week of June, the blueberries start to peek through, and finally, the blackberries are harvested in mid-June through the end of July. The Kelleys also have beehives and peach trees, allowing them to sell honey and peaches. To avoid waste, all the berries that aren’t used go into homemade jams that they sell - strawberry, blackberry, blueberry, and peach jam. Yum! We thrive off of homegrown stories such as these, and we love having Hunter and the Kelley family as a part of our market. Come see the berries for yourself next week at the market and don't forget to head out to Kelley’s Berry Farm to pick some!